I’ve doubts about electric chain saws. But Ed Hutson, who owns the Johnson Creek Rentals and is one of OpenRental’s founders, was saying he prefers electric chain saws for work around the yard. 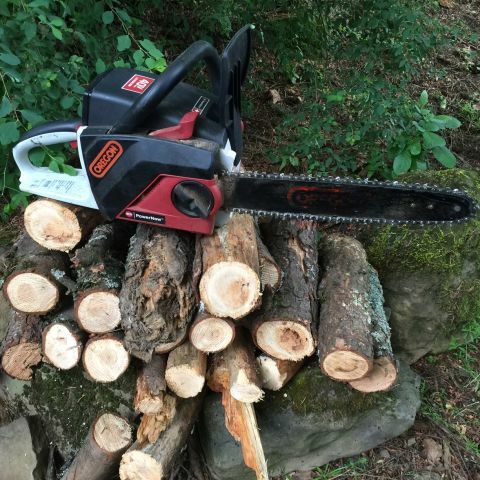 I’ve used gas-powered saws quite a bit, and I have a nifty 16” gas chainsaw, which is about the perfect size for our wooded suburban lot. I like using chain saws – feel the power!!! And hear it, too!! Well I’m just not a fan of gas saw noise and exhaust. Plus, for me, anyway, chainsaws an be temperamental starters. And because I use my saw sporadically, it’s not likely I have fresh mixed gas. So, I thought I’d give an electric saw a try, and got a 40 Volt rental saw with a 16" bar from Johnson Creek Rentals, to compare it with my 16” gas saw. And was I pleasantly surprised! To begin with, it started immediately, I didn’t have to go buy and mix gas, or get the gas/air/choke mix just right and yank away on the starter cord. And no blue plume of exhaust when it first fired up. Also, although the electric saw definitely makes a whining sound, whatever noise it makes has been measured to be four times quieter than a gas saw. Also, the Oregon-brand model I used was self-sharpening, and there’s nothing better than cutting with a sharp chain! Now, to how it actually performed . . . First, I cut up a bunch of downed fir limbs up to seven inches in diameter, and the chips flew. Then I lopped off and limbed our grossly overgrown laurel hedge, which had grown to about 30 feet high, with five- or six-inch trunks. Cut like a champ . . . I had two lithium ion batteries, and when I used up the first one, I just popped in the backup and kept going. So they're really not suitable for an all-day job. My other caveat would be that the electric saw cuts very well if you make a good, straight cut and stick to it; it seemed more prone to stall or get wedged if you alter the cut line, or the chain encountered side resistance in addition to resistance to the cutting teeth. So, good technique seems to be more important with an electric saw, because you can’t just power through it as you might with a gas saw. To conclude, if I had an all-day job of falling, limbing and bucking a good-sized tree, I’d go with the gas saw, but for most jobs I encounter, an electric saw is an attractive option. For me, two thumbs up for the electric chain saw. Nice and quiet, but gets the job done.